Overall comment: Wide variety, refillable & wallet-friendly! Petaling Jaya is still mushrooming with shabu-shabu restaurants, but Sazori stands out with its own uniqueness among the many restaurants. 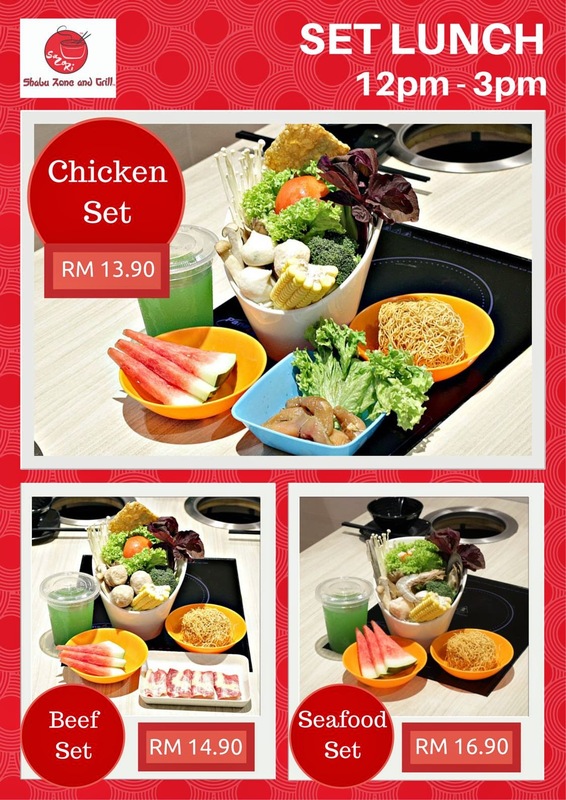 Offering 4 types of soup, unlimited refills of seafood, meat, vegetables, noodles, drinks & ice-cream from just RM26.90/person, this is certainly one place to enjoy the good food with family & friends. The restaurant beams with pride with it's sleek, clean & Japanese-style design, offering all patrons a comfortable environment to enjoy their soups & grills. Sazori offers simple made-in-house sauces to pair with the food. My favorite in this shabu-shabu & grills restaurant is the fragrant roasted sesame sauce, which I mixed with some of their home-made chili sauce & peanut sauce! Sazori offers both shabu-shabu buffet (RM26.90/person for lunch & RM34.00/person for dinner) & buffet + grill (RM31.90/person for lunch & RM38.00/person for dinner). They also offer dining packages for groups that aren't keen on the buffet spread, but have a decent variety of meats & vegetables for their shabu-shabu/grill. Lunch buddies will be more than delighted to know that Sazori is offering set lunches as well! The sets are really worth your penny compared to the many restaurants in this area. Drinks are a plenty & they're nicely packed into plastic cups for your convenience. Just pick your choice drink & enjoy :) They have cordial fruit drinks, wheatgrass, & more. I'm not sure if they change their drinks variety every now & then, but these are certainly more than enough of a variety in addition to the available coffee & tea. You'll notice the various color-plates: green = vegetables, orange = meatballs, blue = seafood. During peak hours, I'm quite sure that the blue plates will be snapped up very quickly! One of the most unique soups available here at Sazori is their Ponzu soup, a citrusy, soy sauce based soup that is very appetizing. This is my 1st time trying out the Ponzu soup as my shabu-shabu base & I've no regrets. It's not overly sour, but it's tangy, fresh, savory & slightly sweet at the same time. Give it a try as you'll rarely/never find it in other shabu-shabu restaurants! I think their tom yam is one of the better ones available in the shabu-shabu restaurants that I've been to. Having said that, I also feel that it's too rich to be a shabu-shabu soup base since every other ingredient will cook in that soup & make it even richer/more flavorful. You'll end up with a very salty tom yam soup since it is originally flavorful. The cappuccino was fragrant & I love the simple vanilla chocolate chips ice-cream too. The yam ice-cream had bits of yam in it & same goes the cendol ice-cream. Ah...love the simple excitement! Business hours: Daily 12:00p.m. - 3:00p.m., 5:30p.m. - 10:00p.m. Edo Ramen proudly offers the original handmade Tokyo-style Japanese ramen, a unique recipe by notable ramen connoisseur, Mr Tetsuya Fukino. 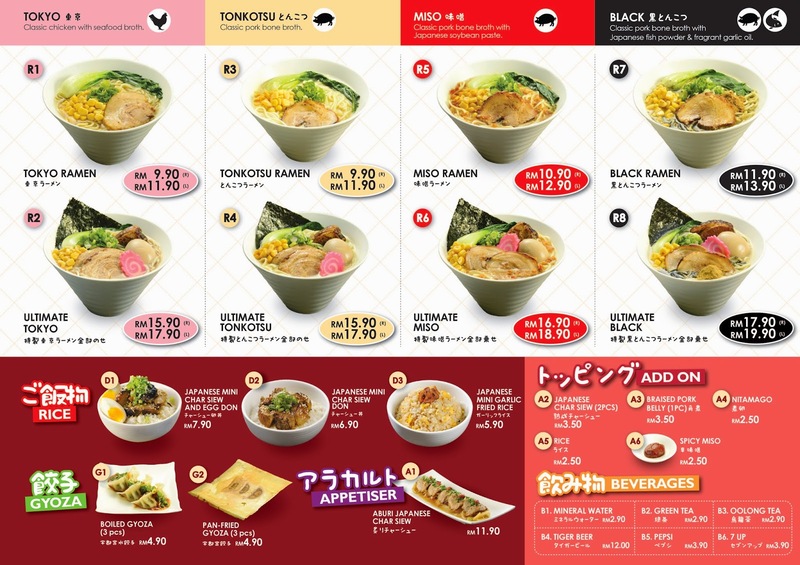 Having started its first outlet at Gurney Paragon in Penang in the middle of this year, Klang Valley residents can now enjoy this unique ramen at Mid Valley Megamall itself since the restaurant opened late August this year. Edo Ramen branched off from Goku Raku Ramen & brings a fresh approach to ramen indulgence at greater value (price & taste!). The outlet at Mid Valley is pretty spacious, with 2 sections of the restaurants for all guests. You could also take a sneak peak into the ramen kitchen where the chefs churn out the handmade ramen & serve it with a choice of 4 types of soups & 2 categories of toppings, according to your order. For those who are not familiar with the Tokyo-style soup base, you would be pleased to know that this chicken & anchovies based soup is boiled over low fire for 7 hours! One can't deny that the soup will definitely taste flavorful. Every ultimate bowl of ramen comes with seaweed, braised pork belly, Japanese fish cake, & a lava egg in addition to the usual toppings of char siew, sweet corn, pak choy & spring onions. I just love the way the braised meats melt in the mouth...yums! Plus, I also love the fact that the broth tasted rich, well-balanced in flavors (aromatic, not overly salty) & hearty from the many hours of slow boiling! The lava egg is pretty nicely done. Wish it was more 'lava-ish' though. 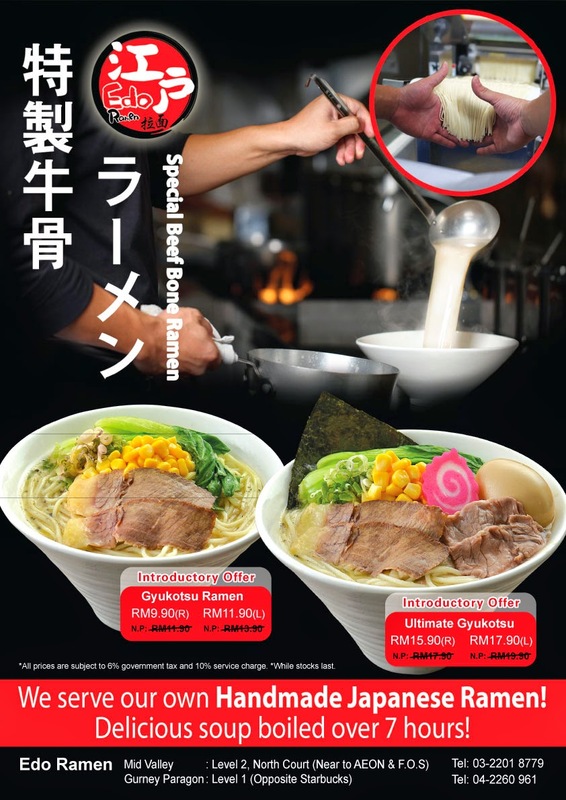 The Tonkotsu broth is another option available here & is a popular choice among pork lovers. This thick broth made from pork bones is boiled over medium to high heat for 12 hours, presenting a hearty pork flavor without the unpleasant 'porky smell' ("sou" smell in Cantonese) & a creamy consistency. You can enjoy the broth in 3 flavors i.e. classic, miso (tonkotsu cooked with Japanese soybean paste) or black (tonkotsu with Japanese fish powder & aromatic charred crushed garlic oil) together with your ramen. Somehow most of us prefer the miso-flavored tonkotsu broth over the black tonkotsu broth. I think it's because it is less oily (no charred garlic oil) & you can taste the authentic miso paste that didn't over-power the goodness of the tonkotsu broth itself. The gyukotsu is a new type of broth introduced recently at Edo Ramen. Just like the tonkotsu broth, this broth is boiled from beef bones. I felt that the tonkotsu broth still wins as the gyukotsu broth was still lacking the 'beefy' taste. Having said that, it's certainly a good alternative & variety for those who are so used to tonkotsu broth & would like to go for the beef broth for a change! There's a small variety of textures in this simple side dish: tender pieces of char siew that melts in your mouth & crunchy onions + sesame seeds. The sauce was slightly sourish too, which gives the savory dish a little kick & uniqueness. Business hours: 10:00a.m. - 10:00p.m. What a night! It'll be one of the most memorable dinners in the year 2014 for The Ruthless Eater :D Dining amongst talented world-class chefs from our own home-ground, together with people with charitable hearts for those who are less fortunate in this world was just a privilege & honor. The Charity Gala Dinner held in conjunction with the celebration of International Chef Day 2014 took place at the Cilantro Culinary Academy on the 18th of October 2014. This dinner was an initiative by the World Chefs without Borders, Chefs Association of Malaysia & Cilantro Culinary Academy. All funds raised at the dinner will support the work of caring matters by the World Chefs without Borders. Each guest contributes RM250.00nett for charity & in return, get to enjoy a sumptuous meal by world-class chefs from our own home-ground. The evening began with cocktail at 7:00p.m., featuring Chef Amy Beh's Jiu Hu Char amongst 2 other small bites. It was simple yet fragrant & 'fun' to pop into the mouth while looking forward to the full dinner menu for the evening. Guests were also served wine, JKS - Amigos Beer & orange juice to accompany the small bites. Up next, guests were served Chef Eric Siew's "powerful" Fresh Prawn Bisque with Blue Swimmer Crab Timbale, Crispy Prawn & Truffle Leek Parcel topped with Avruga Caviar. Trust me, it was 'something not to be missed'! The taste of the prawn bisque was SO intense & fragrant, while the various textures from the Blue Swimmer Crab timbale (generously served in proportion with the bisque! ), the crispy prawn & truffle leek parcel & exquisite avruga caviar just made playful, harmonious music in my mouth! I even 'cleaned' the dish with the oh-so-delicious-made-in-house-by-students artisan breads served throughout the night :D Well done, chef! Artisan breads made by the team at Cilantro Culinary Academy! SO delicious! It took me a while to complete my enjoyment of savoring the fresh prawn bisque dish, but there were more exciting dishes being served! Chef Rajesh Kanna coddled us in his entree of the delicate Wagyu Beef Carpaccio with Hot Salted Smoked Mozzarella Cheese, Caper Berries, Dehydrated Kalamata & Mustard Dressing. The wagyu beef slices just melts in your mouth *drools* As the mustard dressing & the kalamata were quite distinct in taste, it took away the raw taste of the thin beef slices, which some may find unpleasant. The hot salted smoked Mozarrella cheese & purple cabbage gave a good balance of texture & flavor to this simple dish as well. Just lovely. I felt I was in dreamland after the entree when I felt that I was taken even deeper into dreamland by the beautiful presentation of Master Chef Helmut Lamberger's Honey Infused Lacto Chicken Breast with Brussel Sprout, Topinambur Mashed & Chanterelle. Oh my goodness. It took me a while to digest the name of the dish! There were so many ingredients that were foreign to my vocabulary & I felt even more privileged to be at the dinner :D I'm actually not a fan of chicken breasts, but this premium, lean & tender chicken breast did amaze me & fill me 'til I felt all-too-full! I never expected to feel so satisfied to the brim (and almost over-flowing) at a dinner such as this. The mashed topinambur intrigued me & brought me to a whole new learning dimension, away from my usual mashed potatoes. How interesting! According to Nature's Pride, topinambur is a family member of the sunflowers & is native to North Amercia. The tubers are the ones which are consumed. Topinambur looks like a white potato & tastes slightly sweet, nutty, potato, artichoke like. The texture is like a potato only crunchier. Such a rare item in Malaysia & I had the opportunity to experience how this native tuber tastes :D It's also my 1st time tasting Chanterelle & you can imagine how excited I am with all the dishes served that evening! As if it wasn't enough, the evening ended on a sweet note of Pralines. Ah, The Ruthless Eater was highly satisfied! Thank you, chefs! What a fantastic job & a wonderful night of charity & enjoyment of good food! Malaysia is blessed to have such generous & talented chefs!